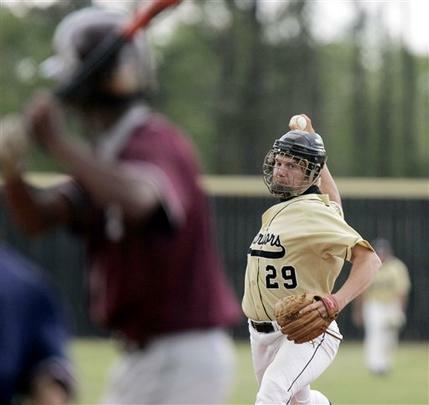 Helmeted pitchers are rare but not unheard of. When Pirates GM Branch Rickey introduced helmets in 1953, he envisioned them replacing caps altogether, so he coated the fiberglass lids with wool flocking to simulate the look of a cloth cap and had his players wear them in the field — even pitchers. That experiment didn’t last long. More recently, though, college pitcher John Fortenberry, who lost an eye after being struck by a batted ball, has worn a helmet and cage-style mask. And then of course there’s Tom Glavine…..
Uni Watch News Ticker: Speaking of pitchers and helmets, Reds pitcher Elizardo Ramirez bats right-handed, but he stepped up to the plate on Tuesday night wearing a left-handed helmet (i.e., with the earflap on the wrong side). The ump brought this to his attention, so he walked over to the dugout to get a proper helmet — but the new one was also left-handed, forcing him to return to the dugout yet again. Finally, he returned to the plate with his earflap where it belonged. The kicker: He singled on the next pitch (big thanks to Trace Tendick for the tip). 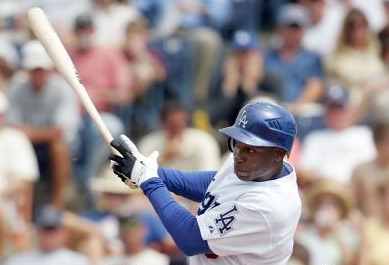 … The “LA” patch on the Dodgers’ left sleeve has been missing from Kenny Lofton’s jersey in recent games (although it was there earlier in the season). … Last week I talked about the growing trend of athletes looking like comic book superheroes (the full discussion is toward the bottom of this entry). Latest case in point: Adam Melhuse’s catching gear. 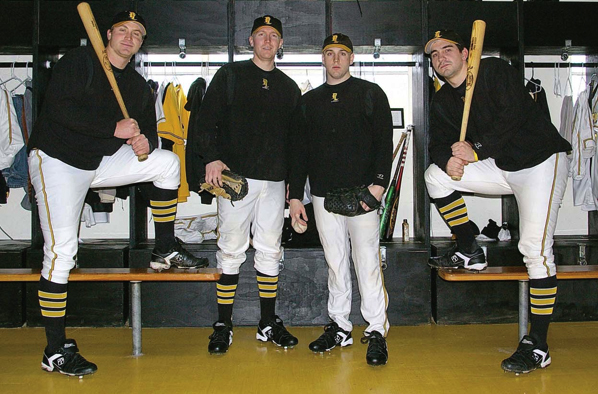 … Anyone who digs striped socks (not that I’d know anything about that myself) needs to see — or maybe enroll at — Pacific Lutheran University, a Division III school in Tacoma, Washington. 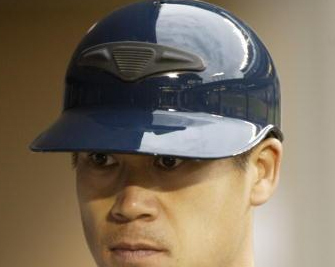 … On the subject of the weird doohickey on Kenji Johjima’s catching helmet (apparently intended to help keep his mask’s strap in place — initial discussion here), Jay Greening checks in with this: “I don’t know who makes it, but I can vouch for its usefulness, in a roundabout way. I have quite a sizeable head (7-7/8, ‘roid-free), and when I caught in high school, given the shape and size of my helmet, the strap was slipping literally with every pitch. If I had to throw to 2nd or 3rd, the mask came off and went flying to my left. So I made a thin roll of athletic tape, about 3 inches long, then taped it to my lid. The strap went below the roll and held in place. 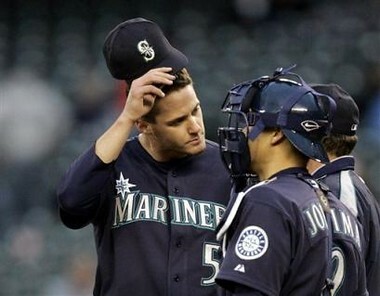 As for why he didn’t wear it in Japan, didn’t his team have the raised logo on the helmet? [Sure enough, they did.] That could have served the same function.” … Still more mood indigo at Shea yesterday, as the Mets wore blue for an amazing fourth straight game. That streak will presumably end tonight, as the team goes on the road, where this is their official look. I won’t be posting much, if at all, over the long weekend. Have a great holiday, and see you back here on Tuesday. An added bonus of the Mets wearing blue: none of those awful 2-tone helmets. good call on the links opening in a new window. as a mac user with no right click, holding control down while i read the entire blog got annoying. -Matt, the mighty mouse is totally worth it. Multiple buttons. Customizable functions, etc. About pop-up windows for the blog photos: If you arrive at the blog by clicking from somewhere else (like from ESPN, say), the blog photos will not open in new windows. But they WILL be in new windows if you go to the blog from a new window — just open a new browser window, go to http://www.uniwatchblog.com, and you should be good to go. The same thing applies, incidentally, if you’re clicking to my ESPN column from the blog. In order to get new windows for the pics, you need to start from a fresh browser window, not a clicked-to window. And thanks for the pop-up comment. This is off topic, but I have been wondering this for a while and I don’t know if you have addressed it on your blog. Ken Griffey Jr. used to wear 24 with Seattle, and 30 for a long time with Cincinatti, but lately I’ve seen him wearing 3 this season. I was wondering if anyone knew why or could try to find out. Thanks. I think I remember reading somewhere that Griffey chose 3 because he has 3 kids, but I don’t recall why he decided to change. 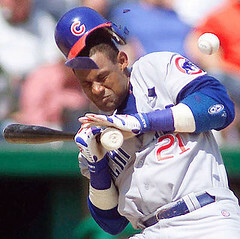 Also, another thought just popped into my mind: will it ever be mandatory for pitchers to wear helmets in the field? It’s a rare occurence, but when a hard-hit ball goes straight up the middle, it usually results in severe injury for the pitcher. Fortunately, there hasn’t been a death (at least professionally) from such an incident, but it is a scary possibility that makes the idea of helmeted pitchers worth consideration. One player who also wore a helmet while playing in the field? Venus Flytrap, on that baseball episode of WKRP. He also wore a scarf in the field. No pictures of either, sadly. 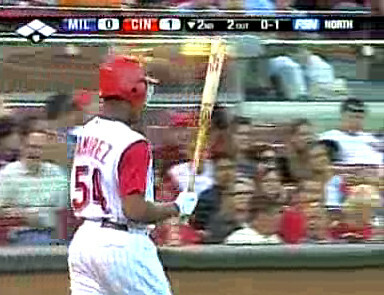 Elizardo Ramirez is a switch hitter (weird for a pitcher, I know), and he had the wrong helmet on going up to bat right handed. I read an article in the local paper about this, and apparently he only batted left handed last year, but has returned to his switch hitting ways this season. 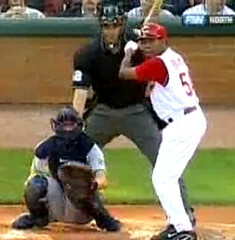 About Jr. Griffey, yes, he switched to the number 3 to honor his three children. Good to see Junior doing well, hope he stays healthy the rest of this season and beyond. sweet. now that i have both Page 2 and the blog bookmarked, i should have no problem. and david, i gotta work on getting the money for my new macbook first, then ill get a mighty mouse. Cincinnati (two n’s and one t at the end) he wanted to wear #24. But in Cincinnati Tony Perez wore #24 and I believe #24 was either retired or going to be retired by the Reds when Tony Perez was elected to the hall of fame. Griffey asked to Perez’s permission to wear #24, and Perez declined. Remember Tony was the manager but was fired after only 19 gmaes or something in 1996-97 ? 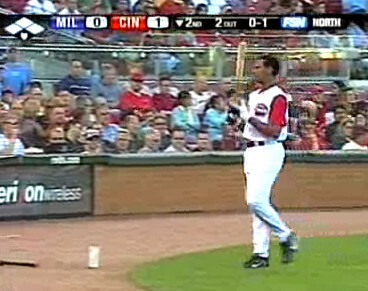 So Griffey decided on #30, the number his dad wore for the Reds. And the others are correct he changed to #3 this spring to because he has 3 kids, and hopefully it will change his luck a little as well. 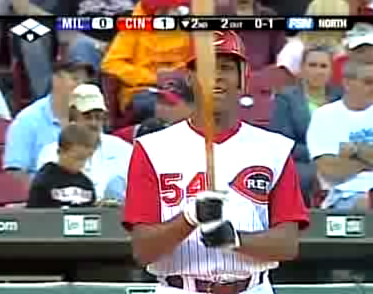 Here is a link to a story from 2000 when Ken Griffey’s Kid was traded to the Reds. My memory was fairly accurate. Norm Cash from the Detroit Tigers wore an unusually weird batting helmet when he played in the Ã¢â‚¬â„¢60Ã¢â‚¬â„¢s and early Ã¢â‚¬â„¢70Ã¢â‚¬â„¢s. Can anyone figure out what’s on Norm’s head? Cash was one of several players who wore a liner. A few players wore these instead of batting helmets. They were allowed to do so if they were already wearing them before helmets became mandatory. The last player to wear the liner was Bob Montgomery, a backup catcher with the Red Sox. A photo of his liner is here. Hey! Thanks for the shout out to the Pacific Lutheran University baseball team. They are usually overshadowed by the football team, so it’s good to know they are doing something right! I grew up in Johnstown, PA and one of the big events of the summer is the annual AAABA amateur baseball national championship. For years, one of the better franchise to participate was Johnny’s Auto Sales out of Baltimore. One year I clearly remember that their entire team except pitchers took the field in flapless batting helmets a la John Olerud. It stands out because they won the tournament and when their team picture was in the local paper they had their pitchers take up the entire back row and it looked cool-the capped pitchers contrasting against the helmet wearing players. I’ve been trying to find a picture but been unsuccessful. I’ll keep trying though. I guess they figured out that the heat outweighed the safety issues and went back to wearing caps a few years later. At one time they had a really sharp pillbox style similar to the Pittsburgh Pirates of the 70s and 80s (red cap with blue bill and stripes). 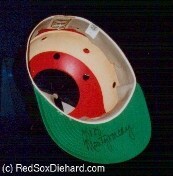 There was actually a jersey and cap from that era hanging in Cooperstown at the HOF at one time. I remember taking a picture of it when I visited their on a vacation in the early 90s.